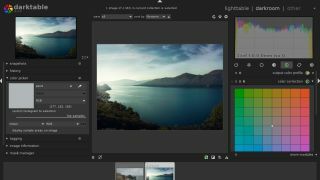 Darktable – a powerful open source raw image editor previously only available for Linux and macOS – has arrived on Windows. This is particularly good news if you've been put off by Adobe's decision to move all its creative apps, including raw image processor Adobe Photoshop Lightroom CC, to a cloud-first subscription service with users' photos stored on the company's web servers. Darktable offers many of the same features as Lightroom, and is designed for organizing images and processing raw files. All edits are non-destructive, so you can revert to the original file at any time, and GPU-acceleration means your images are processed quickly. Darktable for Windows is a new addition, but the Linux and macOS versions have received updates too. Darktable 2.4 includes a new module for haze removal, undo support for masks and more intelligent grouping of undo steps, support for Fujifilm compressed RAF files and much more. See the full release notes.